Homestay Harlingen is located in one of the most beautiful streets of Harlingen. A nice modern apartment in a historic canal house, in the center. 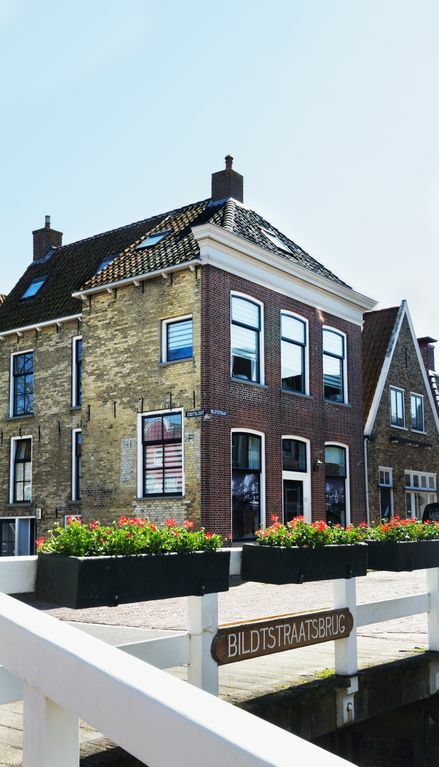 Homestay Harlingen is a beautiful modern furnished apartment in a monumental canal house from 1813, in the center of Harlingen. The Zoutsloot on the side of the house, with all of the state's historic buildings from large to small. Only 2 minutes away from the ferries, the city center and the museum "It Hannemahuis", the sea and the ferries. Just one minute away from the famous Noorderhaven, where the summers are pleasantly full lies with small and large yachts and ships of the brown (sailing) fleet. The kitchen includes a refrigerator, dishwasher, microwave, oven, 2 hotplates, a Senseo coffee machine and kettle. The spacious bathroom has a shower with massage jets and a washing machine. This holiday accommodation is not suitable for people who have difficulty walking because of the open staircase. Although Homestay Harlingen is in the middle of the center, it is quiet, so that nothing stands in the way of a good night's sleep. The spacious bathroom on the first floor, is equipped with a shower unit with massage jets, a separate sink and washing machine. The toilet is on the same floor but in a different room. Towels you do not have to bring yourself these are present. An extensive breakfast on request at € 13.50 per person and can be enjoyed at the hotel around the corner The modern furnished apartment is seated in a monumental canal house from 1813. Gerda is a great host who took the time to ensure we were comfortable. She was quick to respond to us. Her house is terrific and in a great location. We would definitely stay there again. Thank you Dale for your wunderfull response. It was great to have you both! Kurze Wege zu allen Sehenswürdigkeiten, historischen Stadtkern. Top gepflegte Wohnung, nur zu empfehlen! Sehr schöne Ferienwohnung, gute Lage, sehr tolle Gastfreundschaft, auf jedenfalls Fall empfehlenswert! Hele fijne plek, dicht bij centrum en boot. Dank u wel voor uw verblijf, Wik vond het fijn u te ontvangen. Schöne, saubere Wohnung in guter Lage! Die Wohnung ist sehr schön, gepflegt und sauber! Die Lage ist optimal für einen ruhigen Urlaub. Sehr gut fanden wir, dass die Vermieterin uns jederzeit bei Fragen oder Problemen zur Seite stand. Nur zu empfehlen! Homestay Harlingen is located in a quiet side street of the center. Throughout the year you can go walking on the dike along the Wadden Sea or along the beautiful meadows. The ferry to Terschelling and Vlieland is just 2 minutes away from your apartment. The center of Harlingen has a lot of restaurants and cafes, this too is just 2 minutes walk. From July to October you can take a cruise through the Harlingen canals or rent a boat yourself. Breakfast on request, € 7.50 per person.